We're always talking about how NECA (or Palisades or ToyBiz or whoever) is one of the best companies around today. Well, it's time to determine once and for all who is the best of the best. At least in terms of a fully arbitrary vote by the people who really matter, the customers. 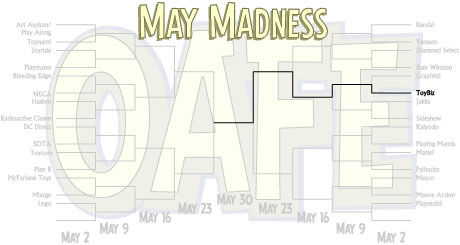 All this month, we're hosting May Madness: the tournament-style elimination bracket that pits companies against one another. Who will take it? Whose toys will reign supreme?! Nearly a decade ago, a man's fantasy became reality in a form never seen before, McFarlane Toys, an evolution in toymaking. The motivation for spending his fortune to create these was to encounter new, original toys, which could be called true artistic creations. To realize his dream, he started choosing the top sculptors of various styles, and he named his men the Iron Chefs. Well, actually, they named themselves the Four Horsemen and began to develop the style that would lead inexorably toward the modern renaissance in American action figures. But now there are a lot of companies offering direct, high-level competition to one another. That's why we ask you to vote. Every battle, reputations are on the line. Whichever company wins will gain the people's ovation and fame forever. Or at least for a week, when someone contests the results. Persnickety geeks. It was a tough five weeks, but in the end, one company managed to claim the top spot in the industry. Toy fans were asked to vote, and they chose ToyBiz. Considering how much fans of... certain companies complain about ToyBiz, it didn't even seem guaranteed that they'd make it out of the first round. Of course, it didn't hurt that their competition was Graphitti/Big Bang, the folks who wasted both plastic and shelf space with last year's worst toy, the Clerks Inaction Figures. ToyBiz won 100% of the vote. Sideshow Toy, the purveyors of fine 12" figures, was ToyBiz's competitor for Week 2, after defeating Jakks Pacific with 55.56% of the vote. The figures may be bigger, but they sure didn't put of much of a fight, and ToyBiz earned more than 94% of toy fans' hearts. Week three set the homegrown company against one of the biggest importers around, Bandai. With licenses like Power Rangers and Gundam, Bandai had just eased by fellow importers Yamato and Diamond Select Toys. Against ToyBiz, however, the company only got 8% of the vote, ensuring the Marvel figures a place in the Final Four. Week 4 may have been ToyBiz's toughest, though the numbers don't necessarily reflect that. Up against Palisades, ToyBiz still got more than 72% of the vote, but a lot of the votes came in at the last moment - did fans need the extra time to decide who they wanted? Though the Muppets had carried them easily through the first three weeks of May Madness, Palisades eventually fell victim to their own pricetag. So it was down to the final round, and ToyBiz found itself up against NECA, the fan-favorites who gave the world Hellraiser, Gremlins, Kill Bill, Freddy vs. Jason and A Christmas Story figures, with Pirates of the Caribbean on the way. NECA today is what McFarlane Toys used to be five years ago - the hot rebel company whose decisions matter. Still, when put to a vote, the fans chose ToyBiz almost 2-to-1. With Marvel Legends, they provide low-cost figures with lots of articulation, a very good sculpt and a detailed base. The Marvel Select line focuses on the sculpt, but doesn't resort to immobile statues. Their Lord of the Rings toys cover a wider variety of figures than any fan of the novel or film would ever have hoped. For all that they act like a typical big company (lots of pointless variations, unbelievable shortpacks), ToyBiz gives fans what they want: affordable toys that look good and are fun to play with. They may not be the flashiest, but according to fans, ToyBiz is the best.